iss Haughty Hollyhock was a flowering plant of “special magnificence”. High in the air, she stood, looking down at the flora around her. The gentle breezes would nod her head and she bowed in agreement to her importance in this world. She knew, without a doubt that she was truly beautiful and a real stunner, to say the least. Because of her lofty position and thoughts, rarely did she notice those beneath her shade-giving leaves. She stood straight and tall, with a glow about her. The color of her blooms was as the last flicker of sunset; rich and lushly saturated. They caught the sun and displayed various colors, just as stained glass; rich and wonderful. One day, a mighty wind blew down the trail where she resided, bending and breaking trees and bushes. With one strong gust, Miss Haughty Hollyhock bent her lovely head and, SNAP! Downward her great blooms dropped. The wind continued to gust and blow. Then a hush ensued. With the returning peace, Miss Haughty Hollyhock discovered that she was bent in two and found herself staring at the ground around her roots. With a start she blinked and looked around her. Scattered around her roots lay a large pile of trash. Horrors, she thought. It was a humbling experience. Day after day, Miss Haughty Hollyhock stared at the ground and the pile of trash surrounding her feet. How did I get here, she thought. I am the Queen of Flowers and what do I have at my feet? Trash! After a time, a kind soul came strolling down the trail. This person walked with a spring in her step and was happily dreaming of a time long past, when life was slower and softer. Suddenly a brilliant flash of pink caught her eye. It seemed part of her dreams of beauty. 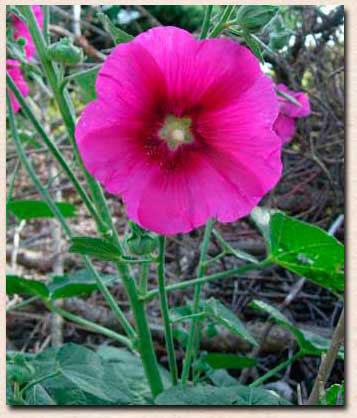 Coming out of her reverie, she realized that the pink was in the form of a beautiful hollyhock flower. She slowed down in order to enjoy the loveliness of the flower and realized that the once elegant stem was bent in two, with the top of the plant facing the ground. 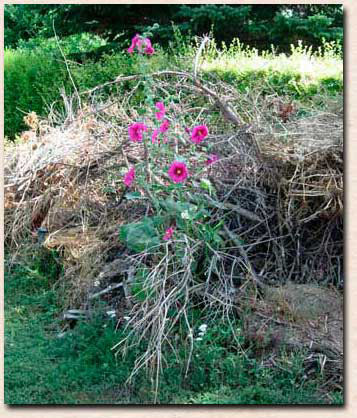 Quickly she reached for a branch out of the pile of trash, gently lifted the hollyhock up straight, and wedged the branch in such a fashion that Miss Haughty Hollyhock was once again tall and proud. Ahhhh, sighed Miss Haughty Hollyhock. What a relief! To be able to feel the upper air and see far around her was intoxicating. The traveling soul stood back and smiled for Miss Haughty Hollyhock was grand, indeed. And then off she went, once again dreaming and musing. Meanwhile, Miss Haughty Hollyhock wobbled and wondered. She knew that she was a bit unstable but her happiness overshadowed her grief. With a jolt she realized that even though she was straight and tall, once again, she was still standing in a pile of trash. However, her beauty distracted any passerby and she noticed that they never looked at the trash strewn around her. Instead, they were so taken with the color of her flowers that they gasped in amazement. Long she pondered these things, all the while swaying and wobbling. It came to her that her beauty had nothing to do with the trash around her and she smiled to herself. I truly am blooming where I am planted, she thought. It was a humbling but happy awakening for dear Miss Happy Hollyhock. Beauty comes from a shining face with a lovely smile, even if one is not exactly in a wonderful environment. With a happy countenance, the garbage around us is much less noticeable. If I were passing you by, I would never notice a thing about you except your dazzling smile....that smile that captured the color of the last flicker of sunset.